NEWS: Gold and Silver member are currently banned from the Etihad Premium Lounge at Abu Dhabi. They are directed to the Al Reem lounge instead, due to a lack of space. The new Etihad Premium Lounge in Terminal 1 is now already called the 'old' lounge: there is a new lounge in Terminal 3 which is much newer. 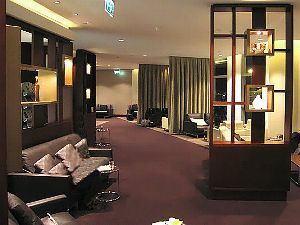 The T1 lounge opened in February 2008 and at more than three times the size of Etihad’s previous premium lounge. It is divided into business and first class lounges and has space for up to 200 passengers at a time: yes, it is that small. There is practically no space available at the airport for a bigger EY lounge though, and at busy times the lounge is standing-room only. Not exactly an oasis of tranquility. The food and beverage offerings were however outstanding. To find the lounge, trek up to the first floor of the airport, then down the corridor linking T1 and T3, and branch left from the main circle. Head past the Al Reem lounge, go right (just by the X ray machines) and the entrance is in front of you, with first on the right, and business on the left. Beware that the lounge staff take a real dislike to economy passengers without the right kind of Etihad frequent flyer card: you really have to push it if you want to enter with a velocity card for example. The lounge is a small square box, with fairly basic leather sofas - although they do come from the renowned italian manufacturer Poltrona Frau. There is a small viewing deck with views of the gates. The food options are pretty good: arabic in flavour, but with a decent buffet. 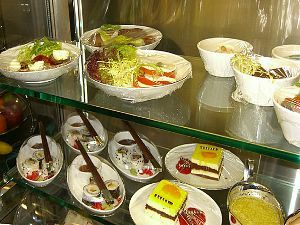 The selection of refeshments includes hot and cold buffet dishes. The dishes are already made up, with cling film over the top. First Class Passengers are able to eat prior to their flight in a fine dining area, which offers a la carte and snack menus. All meals are prepared in an "open kitchen", accompanied by a range of new wines and beverages. 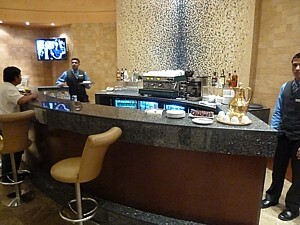 There is a small bar, but it is very discrete, and few people in the lounge will be drinking. Bathrooms and showers are in the lounge. There is a study themed timber panelled business centre which is equipped with six fairly new computers. There is free internet access and wifi, and thankfully around the lounge fairly good power points for laptops. There is a telephone in the business centre, and a fax. 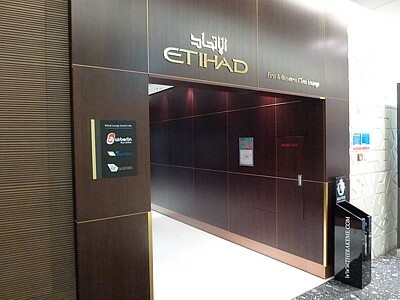 NEWS: Frequent Flyers are temporarily banned from the Etihad Premium Lounge at Abu Dhabi. Frequent flyers with elite status travelling in economy with Silver or Gold status are now only permitted access to the Al Reem lounge. Platinums can occasionally force their way into the Pearl Etihad lounge. There is now a brand new lounge at Abu Dhabi for Etihad. As befits the airline which is raapidly growing, and gaining increasing Europe to Australia traffic, it has now opened a large new lounge in terminal 3. Indeed, there are two - one for First Class (called Diamond), and one for Business Class (called Pearl in Etihad's language). The Etihad lounge Abu Dhabi is large with decent leather sofas - they come from the renowned Italian manufacturer Poltrona Frau. And it must be said, the main part of the lounge does look very nice: certainly much better than the lounge in Terminal 1. The lounge itself it split into several walled off areas, with classy wooden dividers or curtains. At the far end of the Etihad Abu Dhabi lounge, there is a small viewing deck with views of the gates. 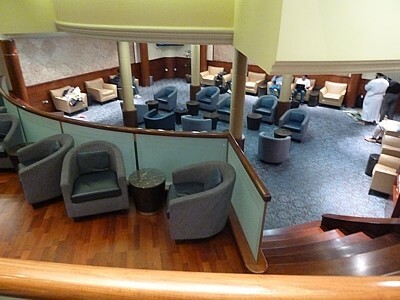 The main problem with the Abu Bhabi terminal 3 Lounge is that it is rammed between 8pm and midnight: it can be standing room only when the main connections from the UK to Australia take place, but empty at other times. As a result, the lounges are now strictly for Business Class only: you can no longer gain entry with a Gold Frequent Flyer card. At the end of the lounge there is what is called a 'hi-tech electronic games room'; in effect this means a fairly basic area with an xbox. There is also a smoker's lounge and gallery showcasing work by local Arab artists. Finally there is also the Children's area, which is equipped with books, toys, TV and a children's dining menu. There are even nannies who watch over the children. The food options are pretty good: Arabic in flavour, but with a decent buffet. 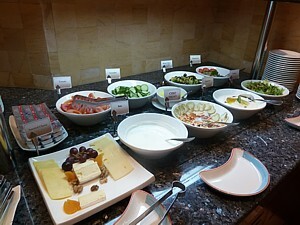 The selection of refreshments includes hot and cold buffet dishes, which offers a la carte and snack menus. There is a quie decent bar area here, with some good new-world wines. Bathrooms and showers are in the lounge. There is even a small spa. There is a study themed timber panelled business centre which is equipped with six fairly new computers - they are iMacs. There is free internet access and wifi, and thankfully around the lounge fairly good power points for laptops. 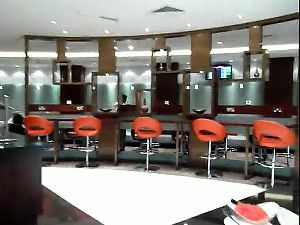 The Al Reem Lounge at Abu Dhabi airport is a miserable desolate hole compared to the Pearl Lounge in Terminal 3. Many frequent flyers with elite status travelling in economy are shocked to find themselves in this lounge, rather than in the decent Etihad lounges, however in the manic evening period between 8pm and midnight, the Pearl lounge can be packed to the rafters – and then some – so for now, everyone with Silver or Gold status is shoved in here. Platinums can occasionally force their way into the Etihad lounges. The Abu Dhabi Al Reem lounge is designed for those with status, or with the right credit card, or even as a pay-per-use lounge for those people too poor to afford the more affluent Al Dhabi Lounge next door (which has better showers). So why, then, would you want to visit the Al Reem Lounge at Abu Dhabi airport? Well, actually, it isn’t too bad once you get past the down at heel daggy decor and the worn out seating. On a stopover you can at least get a shower, a drink, and some OK ish hot food, watch a bit of telly, and put your feet up. Assuming that there is room to do all of this of course: at peak times, this lounge can have them sleeping on the floor. The lounge is located on the walkway between Terminal 3 and 1, but at the Terminal 1 end, and down a side alleyway towards security (and all the other lounges). 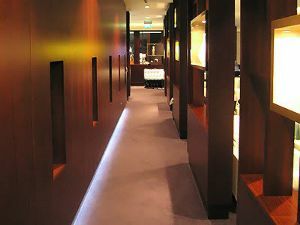 There is a long narrow wood panelled entryway which can frequently become blocked by arab entourages; to visit you need to factor in another 10 minutes queuing to get entry into the lounge. The main part of the lounge is one large hall like room, with a bar at one end, and food at the other. There are two other levels which can be quieter: on the far side there is a strange kind of basement level deep in the ground, and along one side there is a balcony with seating. This area feels a little strange, rather like an out of use theatre. Bathrooms are on the opposite side of the lounge to the basement balcony. 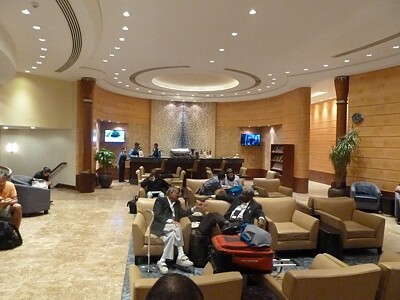 The Abu Dhabi Al Reem lounge has a terrible reputation among frequent flyers as being tired, dull, smoky, and cheap. It is badly organised, with slow staff. It is also a right pain to get to if you are flying out of Terminal 3. The walk is only about 10 minutes, but you also have allow for security at each end, of another 10 minutes. Allow queuing time to get into the lounge, waiting for the waiters to get you a drink, boarding time and so on, and the lounge is really only worthwhile visiting if you are in Terminal 3 if you have a good 2 hour layover – and then some. On a 2 hour stop you may only have a rushed, stressful, 10 minutes in the lounge. The food area is at the far end of the lounge, with a central area with eight hot tourines, on the left of which are cold deserts, and on the right salads. During dinner times the hot food is very good, with chicken, beef, and fish in various types of curry with rice and pasta. 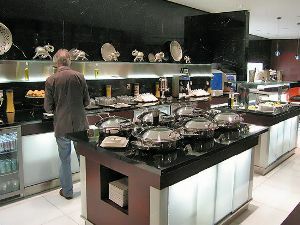 At breakfast there is a fairly standard hot buffet selection, including scrambled eggs and chicken sausages. Lunch is similar to dinner. However at all other times you’re pretty stuck: there are sandwiches and a few snacks, but not a lot. The buffet is timed to local eating habits, even though most passengers are passing through, and on a very different body clock. The biggest problem with getting something to eat comes at the midnight peak: the lounge is very busy at these times with transit passengers, however the staff clear away all the food – after all, it’s not a local eating time, so why would anyone eat? The bar at the other end of the lounge is equally wacky and charmless. Theoretically you can sit at the bar on four wobbly rotating leather armchairs, however the staff behind the bar are absolutely determined to serve you at your seat – not in these chairs. If you just walk up to the bar and ask for a drink they will determinedly show you back to a seat in the main lounge, and then go off to get your order, and return with it a good 10 minutes later. Service can best be described as slow. Never the less, drinks here are quite good. There is a decent range of spirits – all complementary of course. Beer is Heiniken or Fosters. Wine is fairly low end Australian and New World blends, but with a couple of variants of red and white. There is even a sparkling wine if you ask. There are showers and bathrooms in the lounge, of a kind. Both the ladies and gents are very small, with only two stalls in each. There is also a shower in each one, however the staff insist of giving the shower a good clean, and then allowing it to dry, before the next customer is allowed in, which can take an hour. There is no queuing system. As a result at peak times with the lounge overflowing, it is very unlikely you’re get access to the shower. There are no business facilities in the lounge, except for free Wifi. There is a small magazine rack next to the bar. Above the bar there are two TVs: one is usually on BBC World, the other CNN. There is also a small flight information screen. All reviews and opinions on Etihad Airways food, service, seats, planes, upgrades, lounges, and the Frequent Flyer scheme are given as a personal opinion. No legal liability is accepted if you take my advice.